The old maxim admonishes you not to keep all your eggs in one basket. Today, Nice Price or Crack Pipe wants to know if that's still true if your basket happens to be an egg? Yesterday, 91% of you who managed to make it through the great hamster uprising of '09 condemned your souls to eternal damnation by voting crack pipe on the savior's sedan. Spectacles, testicles, wallet and watch. Today, we're heading to post-WWII Germany, where small cars helped get Deutschlanders on the road, trading with their neighbors, and seeing all the countries that could have been theirs if they hadn't been such a bunch of panzy-assed, loser-pants. 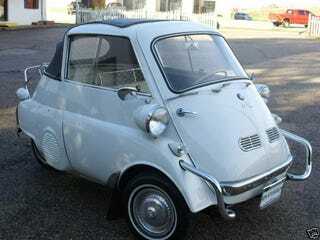 The Isetta was one of the most successful of the post-war micro-cars, despite being one of the most unusual. It's single front-opening door and diminutive stature gained it the nickname Sargwagen or coffin car. BMW didn't originate the Isetta, but instead built the air-cooled cars under license from the Italian refrigerator maker Iso.s.p.a., who was already churning out the scooter-based four-wheelers down in Bresso Italy. The cars were also assembled in France, Brazil and the UK. BMW did successfully re-engineer the car to take a 247cc BMW single adapted from the R25/3 motorcycle. This provided the car with more than twice the horsepower of your average push-mower, and a 53 mph top speed. While driving it's best to consider the 4 inches between your feet and whatever you might slam into, so that speed (if it can be called that) is probably just fine for the little droptop. This '58 example is in very nice shape, and is that rare droptop with a 911-like rear fabric section which may be lowered, and a foldable roof providing a less unborn-chicken feel for both passengers. The years-old restoration appears to be holding up well, and the low mileage indicates either a life well lead, or a broken odometer. So, would you pay the better part of $40,000 for a one-door BMW that's about as far from an M3 as possible? Or, is that a price that makes you think you'd be getting it in the backdoor as well?